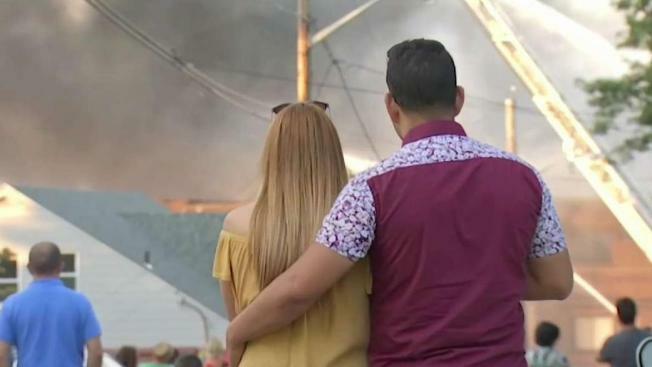 A Revere, Massachusetts building charred in a 5-alarm blaze Sunday remains unsafe for tenants to return, according to officials. Gilmer Santos had just returned from church when the fire started. "The alarm sounded but when I came out I saw the fourth floor, some smoking. But I said, 'Oh, today's a fire, we need to get out." Mariano Fernandez was also home when the fire broke out. 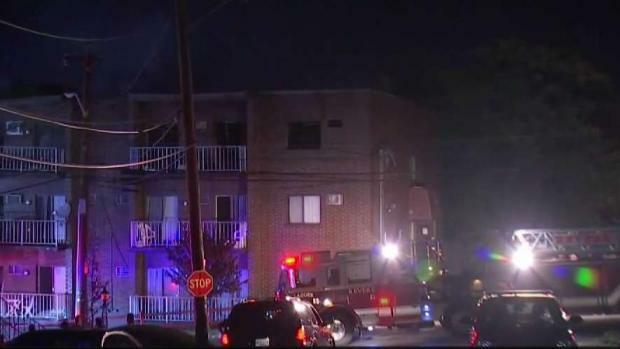 More than 100 people were displaced after a 5-alarm fire destroyed a condo in Revere, Massachusetts. "The smoke is like, 'Boom.' Very strong. I couldn't breathe," he said. He said he lost everything in the fire. "We lost everything we have inside: paper, money, documentation." Three cats, Chai, Blue and Della, are still missing. "Everything in there is replacable, except the cats," said Janna Comeau, the cats' owner. People displaced by the fire either spent the night at the home of family or friends or the Comfort Inn. 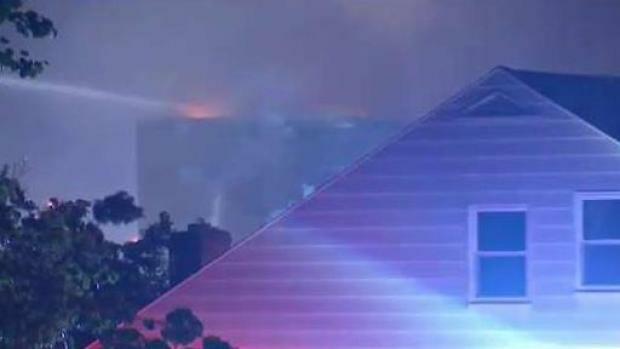 Jonathan Choe reports for NBC10 Boston at 11 that the flames are finally under control. Comeau said she's still not sure if she'll be allowed to return to her third-floor condo. "We're looking for a furnished apartment to rent for a while until we can figure out something better than that. Mostly we just want to get the cats back," she said. Officials said the structure may be a total loss. 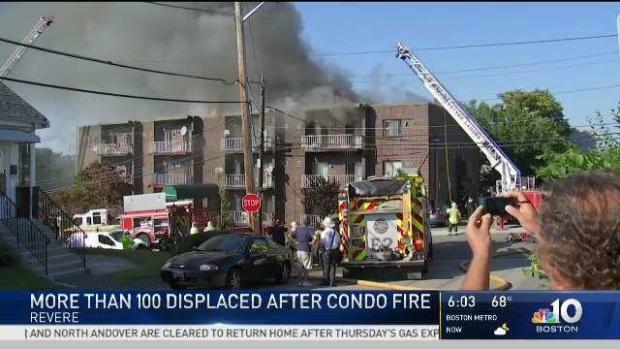 At least 100 residents were left homeless after the fire forced them to flee their condos around 2 p.m. at 10 Franklin Avenue. A temporary shelter at Revere High School was opened by the Red Cross, but residents are searching for their next move. "I’m looking at a total loss," Zouhair Mouty said. "I’m afraid -- Where am I going to sleep tonight, and what’s going to happen tomorrow?" Until around 10 p.m. Sunday night, the flames that started around 2:00 p.m. were still burning, sending smoke into the air. The fire was reported around 2 p.m. at 10 Franklin Avenue, where a 35-unit building houses dozens of families. Fire crews battled the blaze for approximately eight hours before they got it under control around 10 p.m. Firefighters were able to escape the burning building before there was a partial roof collapse. No injuries were reported, but four firefighters were treated for exhaustion and smoke inhalation. They're all expected to be OK.
Fire crews will conduct an assessment to see if the structure is stable enough for an investigation. Although the cause of the fire remains under investigation, some believe the fire started on the fourth floor. The blaze does not seem suspicious, officials said.